(September 2016 - August, 2017). A competitive survey of works by artists attaining or scheduled to receive an undergraduate degree in art or design in 2015, 2016, or 2017. Including $500 best of show prize. A popular favorite—call for works in any and all media, no larger than 7" in size. Calling for works of recent photography for Manifest's annual publication. $2000 in prizes, including $1200 first prize. 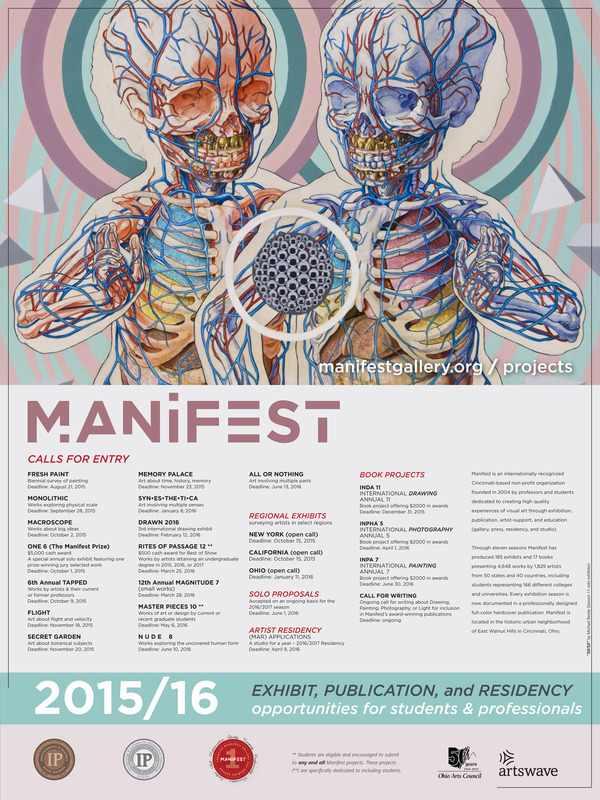 Calling for works of recent painting for Manifest's annual publication. $2000 in prizes, including $1200 first prize. A year-long studio residency to support creative research. The program is open for application by any serious emerging or established artist, including recent graduates from college art programs. The award will include 24/7 use of up to a 500 sq.ft. north lit studio for one full year, exposure to Manifest's visiting public during gallery events, free access to hundreds of hours of Manifest Drawing Center life-drawing sessions, and more.